I was expecting Oprah Winfrey to blow my mind playing Mrs. Which, the wisest being in the universe, dressed as an intergalactic angel with gravity-defying Kim Kimble hair. And I was expecting Storm Reid, the wide-eyed, curly-haired 14-year-old star of the film, to break boundaries of the imagination for other children about what a fantasy-film hero looks like. But I was not expecting this film to be retroactively healing for this 32-year-old black woman who grew up feeling shut out of a genre I love. At the Los Angeles press screening of the film just days before the world premiere, DuVernay surprised the audience by showing up to introduce it. “Let your inner child watch this movie,” she instructed, and I obeyed. Within minutes of Storm’s appearance on-screen with her sweet face, African nose and natural hair, I surprised myself when I started to tear up. Sure, it’s upsetting that her character, Meg Murry, is being bullied by teachers, students and her principal over the mysterious disappearance of her father into another dimension; and yes, the film is rich with inspiring messages of overcoming evil with love and light that tug on every heartstring. But that wasn’t why, by the end of the film, I was alternating between wiping away full-on tears and letting them fall, uninterrupted. It took a moment for me to understand what was being released in that theater. In the mid- to late 1990s, I was a budding child actress growing up in Virginia who’d landed representation with the New York City talent agent famous for discovering Tom Cruise: Toby Gibson. I had filmed my first SAG-AFTRA-qualifying gig as a guest star on the PBS show The Puzzle Place, had two callbacks for the part of Bethany on the ABC drama Second Noah and was thrilled out of my mind to lose the role to the little girl from Crooklyn (Crooklyn!). Things were looking up for my fledgling career. Then my military father was relocated to Offutt Air Force Base in Nebraska and everything changed. Folks weren’t checking for young black actresses in Nebraska. Besides a Wow! potato chips commercial that never aired, and an infomercial for a product to protect your computer from the inevitable crash of Y2K (aww, the ’90s! ), all the parts I auditioned for went to children of a whiter hue. So I tried my hand at theater and was accepted into the local children’s company. But even there, I had little success, playing nameless background roles. In one production, they had me playing one of many “Native American children.” I shudder to remember what that entailed. So when the company announced that they’d be putting on the play based on one of my favorite books, A Wrinkle in Time, in my 12-year-old mind it was a sign. I couldn’t help but kill an audition for Meg—a bullied middle school kid who didn’t fit in but who gets to fly, gets the guy and gets to be the hero. I read for the part and put into my audition every drop of emotion I’d felt being isolated as the only black girl in a sea of white classmates and teachers every day. Finally! This Midwestern nightmare was going to serve a greater purpose. When they announced the casting of a white girl with brown hair and glasses as Meg—just like in the book—I remember thinking, “Of course.” I was more disappointed in myself that I had even thought I had a chance at the role. Black girls can’t be Meg. Black girls don’t belong here. Not even in fantasy. I wound up playing a part so small that it’s not even listed on the SparkNotes character list online, so I can’t recall it now. I quit acting after that production. It would take another 14 years before I would begin to challenge the limits that had been put on my imagination as a child, including that experience. By 2016 I’d published my first novel, a reimagining of American history, about a black teen girl who escapes from her enslaver, the first president, and starts a revolution. When agents, editors and publishing houses said they couldn’t imagine an audience wanting to read such a story, I laughed. Their limits were no longer mine; nor were they shared by the readers I’ve met across the country and in the United Kingdom on tour. Book of Addis wound up winning literary awards for fiction. Pushing through those limits and achieving my definition of success with my novel, I thought that meant I was healed. And then I found myself bawling in a Disney theater as Sade sang “Flower of the Universe” at the end credits of A Wrinkle in Time. Yes, black children need to see this film so they can know that they, too, can be heroes. Yes, all children need to see this film—especially boys—so they can know how to follow the lead of a black girl. But I needed to see this film, too. Twelve-year-old me needed to see beautiful black Storm Reid be Meg and be an outcast and deal with depression and be a hero anyway and travel through space and fly. Twelve-year-old me needed to see Oprah speak life into that little girl’s fear and low self-esteem and say that if she just finds the right frequency, she, too, can fly. Twelve-year-old me needed Ava DuVernay to create the space for all of that #BlackGirlMagic to shine on-screen. And by creating that space, DuVernay wrinkled time, found that little girl in the ’90s who had been trapped for years in a white void and flung the escape hatch wide open. With one film, she reminded me of the healing power of the imagination, and then she healed a hole in my heart that I didn’t even remember existed. Magic, just as I expected. 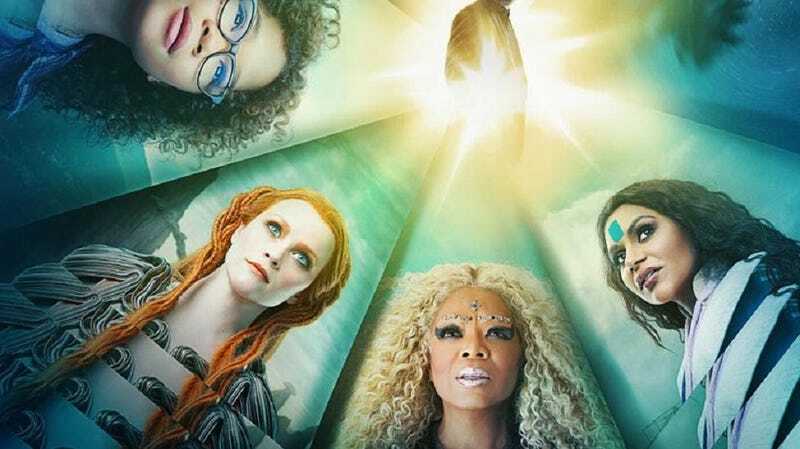 Let’s Do It Again: Send Our Girls to See A Wrinkle in Time!